On Wednesday, 10 April the BGHS Welcome Day in summer term 2019 took place. Ursula Mense-Petermann, Director of the BGHS, welcomed the new colleagues. 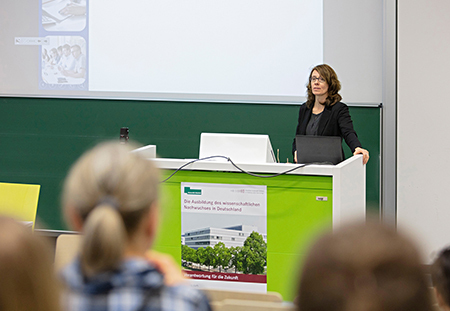 Following this Sabine Schäfer (Executive Management of the BGHS) and Bettina Brandt (Scientific Management of the Department of History) informed the new doctoral researcher about the BGHS, the Faculty of Sociology and the Department of History. 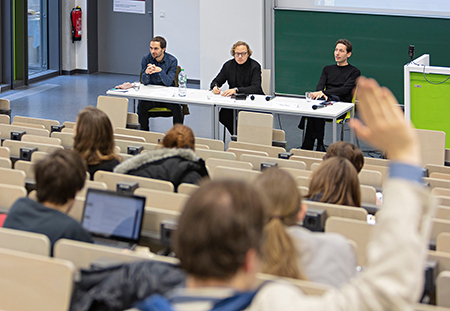 After that the doctoral representatives and Ulf Ortmann, coordinator of the project "Non-university careers for scholars in humanities and social sciences", introduced themselves. 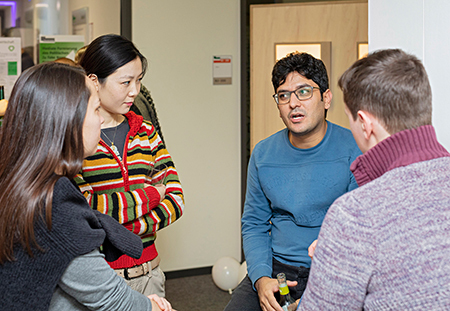 At the following coffee break in the BGHS-Lounge the doctoral researchers and guests had the chance to get to know each other better. 18 new colleagues are starting their dissertaion projects this winter term: Six Historians (5 female, 1 male) and twelve Sociologists (6 female, 6 male). 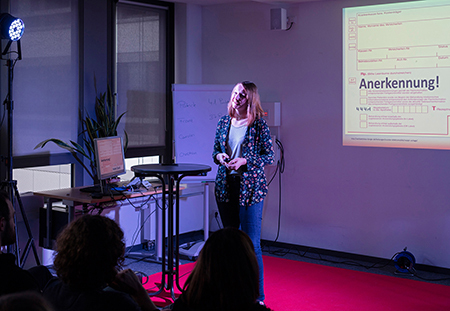 On 2 April 2019 the lecture The White Armband Day – Cross-boarder remembrance to the genocide in Prijedor (Bosnia-Herzegovina) by Johanna Paul took place. After an introduction by Daniele Toro, the artist Anita Zečić spoke about her exhibition and her own ties with the genozid in Prijedor. Afterwards the audience was lead through the exhibition. This was followed by doctoral researcher Johanna Pauls presentation and a discussion. The next lecture on 7 May by Zeynep Demir will be about „The Mental Health of Young Migrants in the (Post)Migration Society“. Everyone is cordially invited. Entrace is free of charge. On 2 April from 1 to 8 pm an exhibition of the travelling memorial "Prijedor '92" by artist Anita Zečić takes place at Ravensberger Park in front of the Volkshochschule Bielefeld. The installation is a dedication for all civilian casualties of Prijedors of the war in Bosnien-Herzegowina (1992–95). Despite struggeling for many years, a memorial does not exist in Prijedor. This exhibition supports the demand of the survivors and makes a first step toward a permanent memorial. 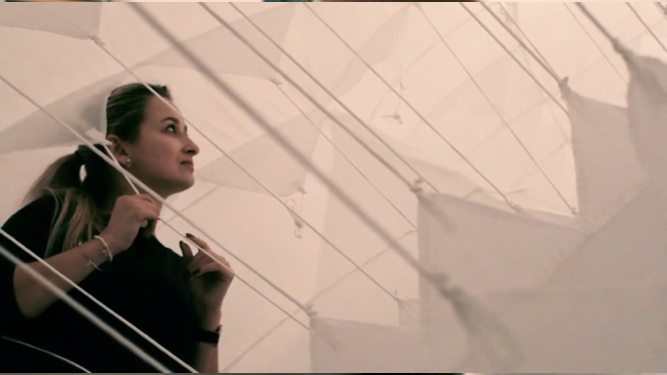 The intent of the installation is to facilitate the sense of fear in closed and narrow spaces without the option to escape. This is only a part of the emotions the captives of the concentration camps had to endure. The exhibition accompanies the lecture The White Armband Day – Cross-boarder remembrance to the genocide in Prijedor (Bosnia-Herzegovina) by Johanna Paul (2 April, 6-8 pm, vhs). Both events are a part of the public lecture series Linie 4 "About the Dealing with Discrimination: News From Social Sciences and History" which takes place from 19 March to 25 June and offers various presentations by members of the Bielefeld Graduate School in History and Sociology (BGHS). 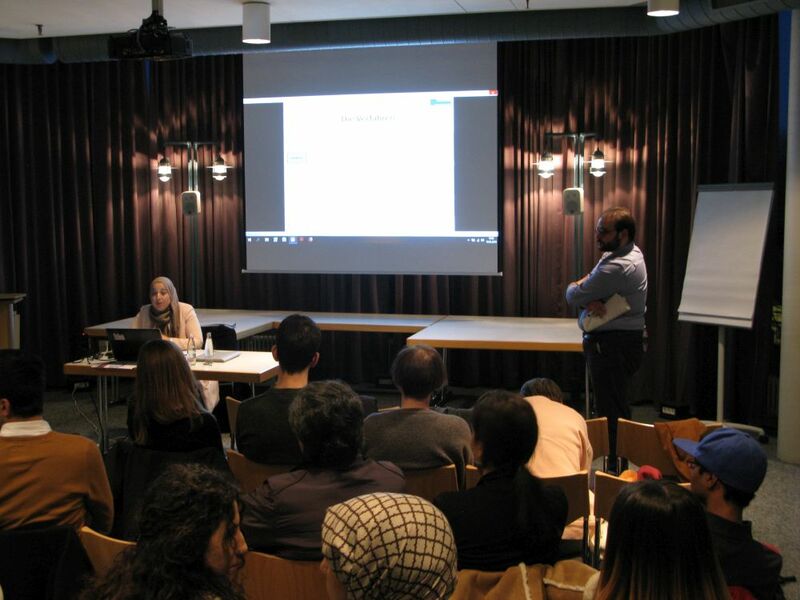 About the Dealing with Discrimination: News from Social Sciences and History, is the title of the lecture series Linie 4 in the VHS, which has opened on 19 March by Malika Mansouri. She talked about the topic "50 Years of ICERD - The United Nations on Racial Discrimination in and by Germany". The well-attended lecture invited with exciting input to discussion and questions. We talked to Malika about her lecture. Malika, how was the event for you? MM: It was definitely a positive and rewarding experience. I found the questions and the discussion afterwards very interesting and fruitful. You could see that the participants were very interested and reflected on the topic. As you know, this is not always the case with this topic. What did you particularly enjoy about the format? MM: I was surprised that some of the participants came from more distant cities. This perhaps shows how important it is and how rarely such themes - racism from a critical legal perspective - are addressed. This makes it all the more important that the BGHS together with the VHS provides a forum for that topic. On 02 April Johanna Paul will give her lecture on "The White Armband Day – Cross-boarder remembrance to the genocide in Prijedor (Bosnia-Herzegovina)". Since 2010, InterDisciplines has stood for a supporting pillar of the BGHS, the interdisciplinary and international exchange between social and historical sciences. After 17 successful editions, the last edition 2/2018 "Social History - Historical Sociology: On Interdisciplinary Research" for the time being now takes us back to the beginnings of this idea. The current issue contains exciting articles by Agnes Piekacz, Chris Thornhill, Felix M. Bathon, Heidemarie Winkel, Laura Benítez Cojulún and Sebastian M. Schlerka. With the end of funding by the Excellence Initiative, editorial work will cease with the publication of the last issue. "A relevant scientific journal and not only an internal magazine." Thomas Welskopp is Deputy Director of the BGHS and Professor of the Department of History of Modern Societies (18th-20th centuries). Since the first issue he has been editor of the InterDisciplines. Thomas, how did the idea of publishing a journal come up? TW : "Our intention was to identify the BGHS as an innovative research context, to offer doctoral students' results a forum that is truly perceived and recognized in the professional world even before they complete their dissertations. And to create an experimental field for interdisciplinary debates that enriches research in all the disciplines involved and has a voice in the international research community." What is the concept of InterDisciplines? TW : In our opinion, the above objectives could be achieved best with a well-done online journal (although there were limited print editions). The main criteria of interdisciplinarity and internationality were implemented with themed issues that were of interest to all disciplines and with an openness to contributions from external sources as well as from all academic career levels. How does quality assurance work at InterDisciplines? TW : The InterDisciplines were supposed to be a real professional journal, not a BGHS house internal magazine and more than a "grey" working paper series for doctoral students. Therefore, we have installed an elaborate quality assurance procedure, with a two-stage peer review process (double blind) and professional (mainly foreign-language) editing. What gave you the most pleasure? TW: The InterDisciplines were an exciting intellectual project in which many interesting discussions about disciplinary boundaries actually took place. The cooperation of the editors, especially with Kathleen Thelen and Peter Jelavich, was also gratifying, as was the commitment of our reviewers. The appearance of each issue was a joyful event. And to be completely honest, I really enjoyed the choice of motifs for the covers. 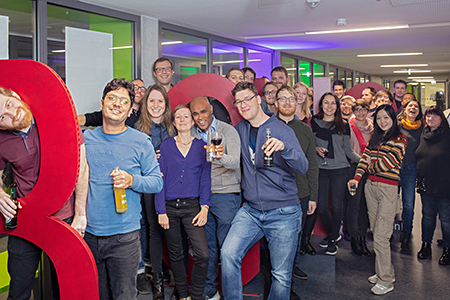 "It's exciting to experience the process of a publication"
As a valuable and sustainable link between various offers and initiatives of the BGHS, InterDisciplines enabled doctoral students to try their hand both as an author and as a guest editor. 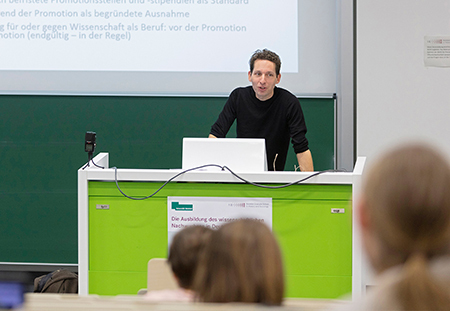 Sebastian M. Schlerka is doing his doctorate at the BGHS under the working title "More than secularism: Islam and Muslims in German parliamentary debates" and has worked as guest editor of the current InterDisciplines. Sebastian, how did you come to work as a guest editor? SMS: I was part of the organizing team for the Annual Seminar in 2017. There I had already expressed interest quite early to participate in the publication of some contributions, which has always happened in the InterDisciplines so far. SMS: Hard working, but exciting. Of course it was a lot of work, especially because I published an article in the magazine myself, which had to be revised several times and I had to deal with a source that was not easy to interpret for the Diss at that time. Nevertheless, I found it exciting to experience the process of a journal publication first hand, from the completion of the call to the search for reviewers and the selection of contributions to the publication of the issue. What interested you in the topic of the current issue? SMS: Since my bachelor's degree in both subjects, sociology and history, I have felt a great closeness between the two subjects and have therefore already worked interdisciplinary in my bachelor's thesis. It dealt with the conflicts within the republican camp in the Spanish Civil War from Bourdieu's perspective. All in all, I think that both disciplines with their common object - human societies that have "become and are always becoming" (Norbert Elias) - can only benefit from cooperation. In addition to the BGHS internal work on the magazine, the question arises as to how far InterDisciplines could reach. The reception data indicate a high benefit. In 2017, approximately 35,000 different visitors* were registered on the homepage with a total of about 437,000 accesses. A new edition generates more hits. In November 2017, for example, the number of visits to the "Postcolonialism and China" edition rose from 37,000 to 61,000. The evaluation is based on OJS views and AWStats from 2010-2018. The BGHS would like to thank all editors, Sandra Lustig (editing), Anne Ware (layout), Melanie Eulitz (editorial manager) and Thomas Abel (cover-design) for their many years of cooperation. In addition, thanks go to all guest editors and reviewers as well as all editorial assistants. We are happy to remain in touch with possible perspectives and would be pleased if the dialogue could be continued. A weekend, secluded from the academic everyday work, to be able to focus on the presentation and discussion of new doctoral projects: That's the Research Retreat . The Research Retreat of 2018 took place from 23 to 24 december in Vlotho near Bielefeld. 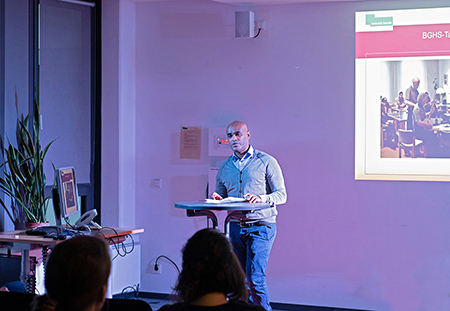 13 doctoral researchers took the opportunity to present and discuss their dissertation projects. 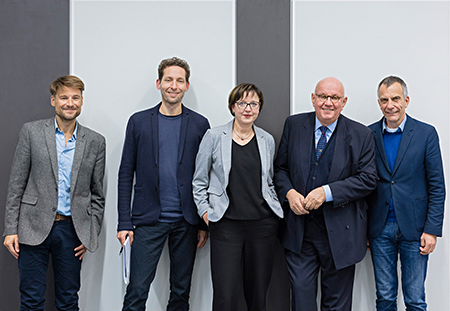 In addition to the new colleagues, Prof. Dr. Ursula Mense-Petermann and Prof. Dr. Oliver Flügel-Martinsen participated in the presentations and discussions of the projects. The yearly research retreat invites first year BGHS doctoral researchers. Besides the presentation and discussion of their dissertation projects the new BGHS colleagues are also welcomed by their doctoral representatives. 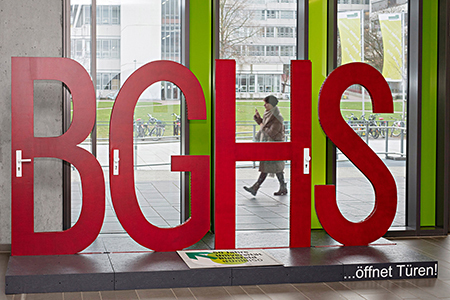 Letter installation "BGHS" in front of the conference rooms. Photo: Philipp Ottendörfer. 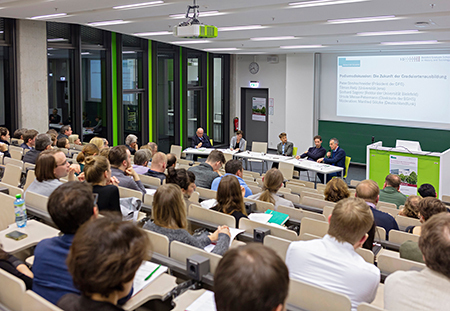 On 30 November and 1 December the conference "Graduate Training of Young Scholars in Germany” took place in the X Building of the University of Bielefeld as part of the 50th anniversary of the University of Bielefeld and the 10th anniversary of the BGHS. The welcome was addressed by the rector of the university, Gerhard Sagerer, who emphasized the success of the BGHS in the last 10 years, as well as the director of the BGHS, Ursula Mense-Petermann. The welcome by the director of the BGHS Prof. Mense-Petermann. The director of the BGHS Prof. Mense-Petermann and the deputy director of the BGHS, Prof. Thomas Welskopp can look back on 10 years of BGHS. Then the two directors of the BGHS, Ursula Mense-Petermann and Thomas Welskopp, looked back on 10 years of BGHS. The main elements and events were recapitulated under the keywords formation and establishment as an organization - the doctoral researcher of the BGHS - the development of the structured study program - interdisciplinarity - internationality - equality - activities of the doctoral researchers - contributions to the structural development of the university. In the end, they showed various results and gave a small outlook on the future of the BGHS. The panel discussion on "The Future of Graduate Training" in X-E0-001. Prof. Reitz (middle) answers questions on the podium. The moderator Götzke on the left next to him, along with Rector Sagerer. Photo: Philipp Ottendörfer. Peter Strohschneider in conversation with BGHS Director Ursula Mense-Petermann. Photo: Philipp Ottendörfer. 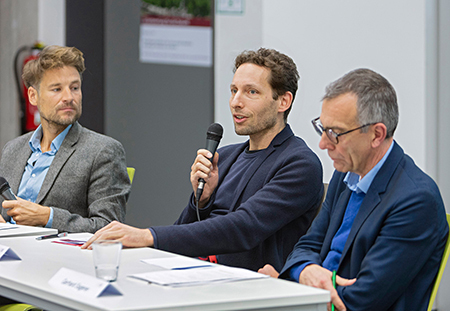 This was followed by a panel discussion titled "The Future of Graduate Training", moderated by Manfred Götzke, editor and moderator of “Campus und Karriere” at Deutschlandfunk. 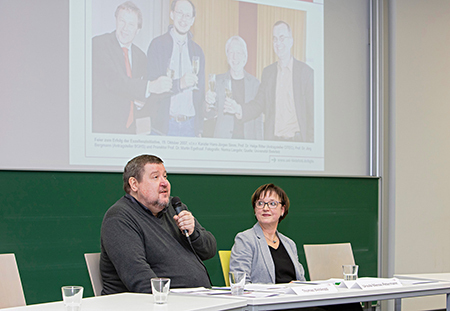 The podium included Peter Strohschneider, President of the German Research Foundation (DFG), Tilman Reitz, professor of sociology of knowledge at the University of Jena and expert on the subject of young researchers, Gerhard Sagerer, the rector of the Bielefeld University and Ursula Mense-Petermann, the director the BGHS, high-carat occupied. The panel discussion quickly became lively. One topic that Tilman Reitz included in the discussion was the 9-point catalog "On the Education and Promotion of Young Academics", which BGHS doctoral candidates had prepared in the run-up to the event and which was also handed over to all panelists. Some questions related to the catalog were then put to the podium by doctoral candidates in the open discussion round. 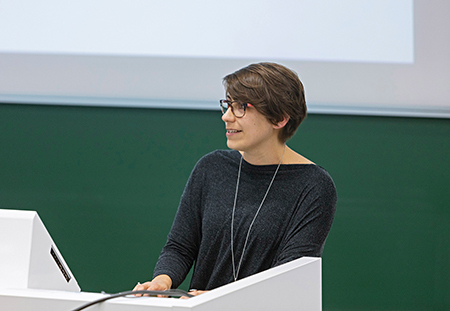 The doctoral researcher Jana Hoffmann hands over the 9-point catalog for training and promotion of young researchers, which was created by BGHS doctoral candidates. Photo: Philipp Ottendörfer. The participants of the panel discussion "The future of graduate training". 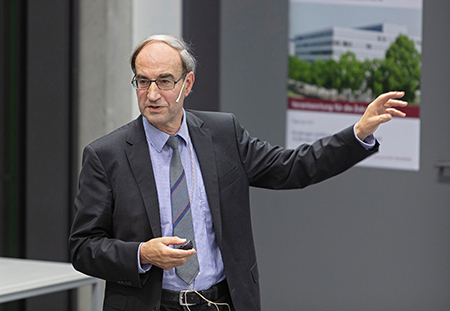 Richard Münch gives the lecture on "Academic careers". Photo: Philipp Ottendörfer. After the panel discussion, there was a small snack, followed by the ceremonial lecture of Prof. Richard Münch, Emeritus of the University of Bamberg and sociologist, who has published among other things on academic capitalism. He gave his lecture on "Academic careers. Between global competition and national traditions." The next morning, 1 December, the conference continued with two panel discussions. The first panel dealt with the topic "Situation of Young Scientists" and was moderated by Prof. Flügel-Martinsen. 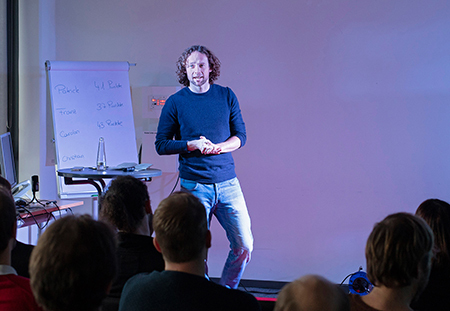 The first lecture was given by Jens Ambrassat from the German Center for Higher Education and Science Hannover. The lecture was titled "Staying in Academia? 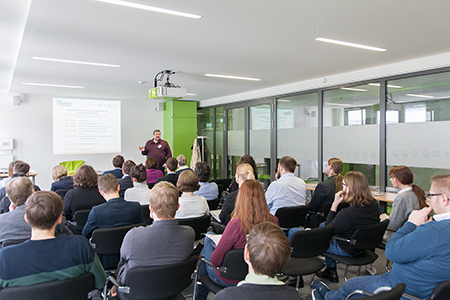 On the opportunity structure of young researchers" and gave an empirical basis for the current employment situation of doctoral researcher and postdocs in German academia. The peculiarities of humanities and social scientists became clear. As the second speaker Tilman Reitz talked about the the plight of employment of young scholar- about causes and alternatives. Jens Ambrassat (DZHW) gives a lecture on remaining in academia. Tilman Reitz (University of Jena) talks about the employment misery for the young researcher, its causes and possible alternatives. Photo: Philipp Ottendörfer. Panel 1 on the Situation of young researcher. Photo: Philipp Ottendörfer. 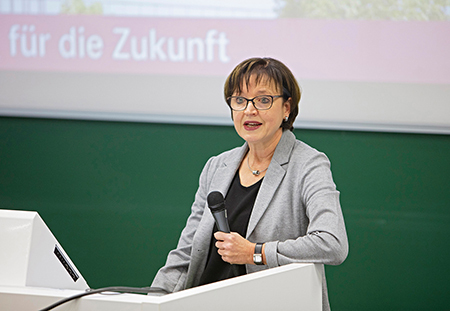 Carola Bauschke-Urban (Fulda University of Applied Sciences) spoke about doctoral thesis at the University of Applied Sciences. Photo: Philipp Ottendörfer. 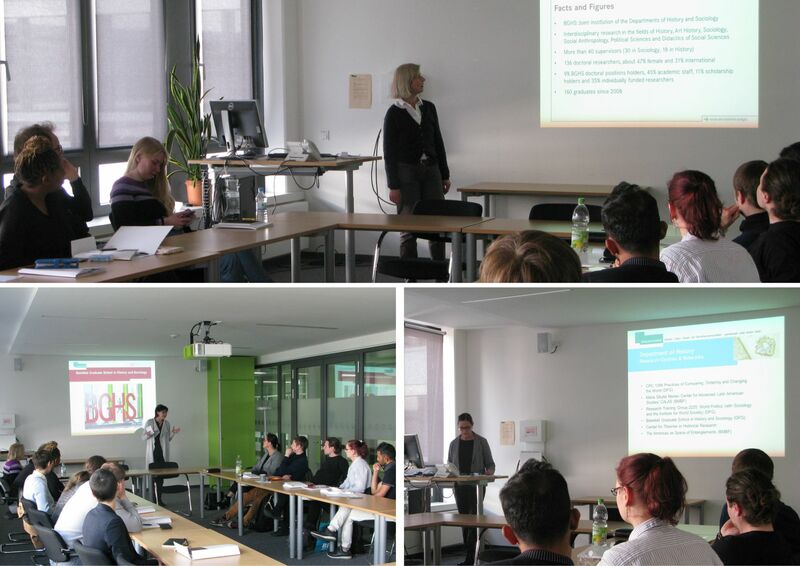 Mandy Böhnke (University of Bremen / Jacobs University) was dedicated to the topic of doctoral research in a network. Photo: Philipp Ottendörfer. The second panel was about cooperation and competition in academia and was moderated by Sabine Schäfer, the academic director of BGHS. 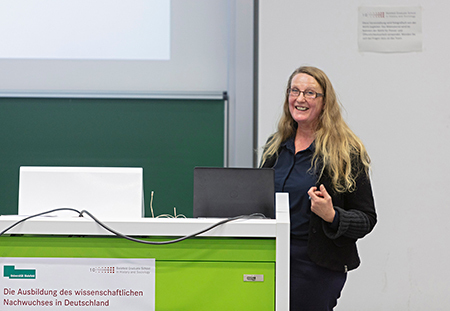 Carola Bauschke-Urban from the University of Applied Sciences Fulda spoke on the doctoral thesis at Universities of Applied Sciences and Mandy Boehnke of the Bremen International Graduate School of Social Sciences on doctoral thesis in a network. Panel 2 about cooperation and competition in academia. Photo: Philipp Ottendörfer. A snack on X-B2 then leads to the ceremonial part. On Saturday afternoon, the jubilee could be celebrated in the premises of the BGHS with various program items. The presenter Sissy Lorenz warms up the audience for the Science Slam. The moderator Sissy Lorenz first led a Science Slam, in which three BGHS doctoral researcher and a BGHS alumnus competed and slams were heard that have revealed, for example, how to get into the holiday paradise with blast prices. Then the alumni Ulf Ortmann and Mahshid Mayar talked about their time in the BGHS and the doctoral representative for the International, Sisay Dirirsa, read a letter from the Alumna Rumin Lou. 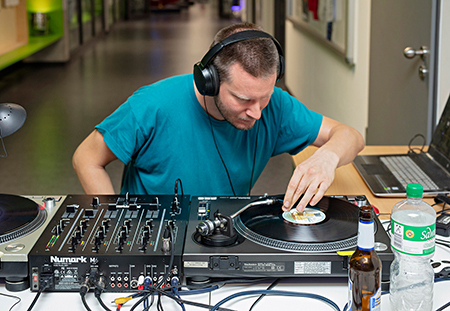 After Reinhard Nießner had performed the piece "From the Life of a Humanities Scientist", the 10th anniversary was celebrated for a long time in the rooms of the BGHS. The participants of the Science Slam Patrick Kahl, Franz Kather, Carolin Kunz and Christian Ulbricht in the order of their appearance. Photo: Philipp Ottendörfer. Sisay Dirirsa speaks for the international doctoral researcher of the BGHS and reads a letter from Alumna Rumin Lou. Photo: Philipp Ottendörfer. The DJ at the BGHS anniversary party. Photo: Philipp Ottendörfer. Party talks at the BGHS anniversary party. Photo: Philipp Ottendörfer. BGHS doctoral researchers in front of the letter installation ‘BGHS’. The University in Lund. Photo by Stefanie Haupt (BGHS). According to that, also personal conversations were helpful and inspiring for further steps in their research. As Stefanie said: "Those two weeks were so much fun! Everyone was welcoming, showed interest in our projects and supported us excellently. Tack så mycket!" 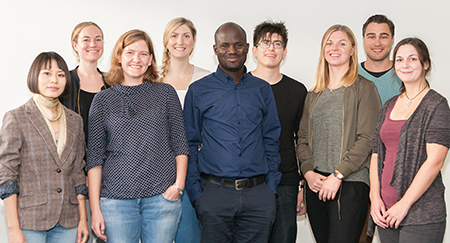 The Desk Exchange-program offers the possibility for doctoral researchers from Lund and Bielefeld to get an insight into the academic system abroad, to come in contact with colleagues and researchers internationally. Therefore they meet during two weeks in Lund and two weeks in Bielefeld. This year the BGHS celebrates its 10th anniversary. The programme of the final conference within the jubilee entitled Graduate Training of Young Scholars. Responsibility for the Future on 30 November and 1 December offers many highlights: a panel discussions, a jubilee lecture and various panel session to the conference topic. 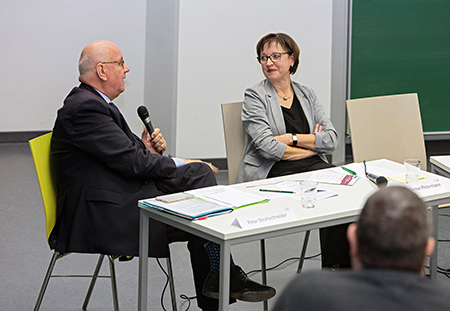 At the central panel discussion The Future of Graduate Education the BGHS welcomes as discussants: Peter Strohschneider (President German Research Foundation, DFG), Tilman Reitz (University Jena), Gerhard Sagerer (Rector Bielefeld University), Ursula Mense-Petermann (Director BGHS). Moderator of the discussion is Manfred Götzke from Deutschlandfunk. On saturday afternoon the BGHS celebrates its birthday with a science slam and a birthday party. All BGHS members and guests are cordially invited. In January 2019 the BGHS will launch the pilot project "non-academic careers". 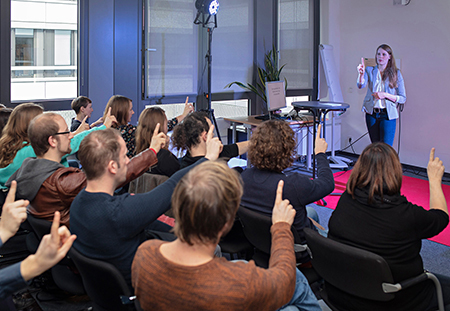 For a three-year term, the project, which is financed as part of the Universities’ strategic budget, supports doctoral researchers with their professional job decisions, nationally and internationally. 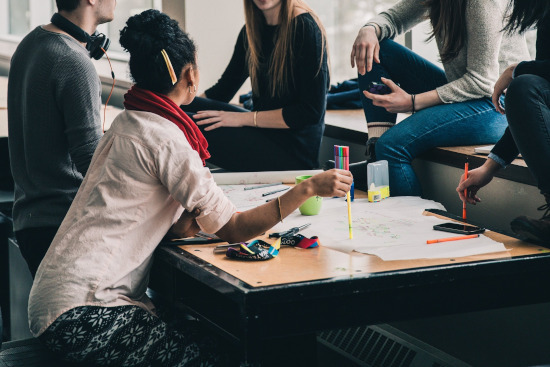 During the project, a broad network to non-academic partners is going to be established, such as foundations, NGOs, public or economic corporations. 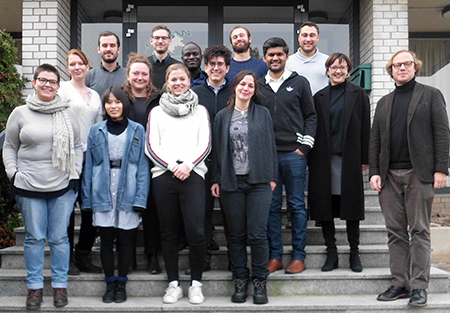 Twelve doctoral researchers from BGHS will have the possibility to gain practical experience in these organizations and will be accompanied by a supervision-program to reflect their experiences. For ten more Graduates there is going to be a Mentoring-Program. The project stands in line with the recent and past BGHS-events for non-academic career options, which were actively provided in the area of Transferable Skills and Career Service. 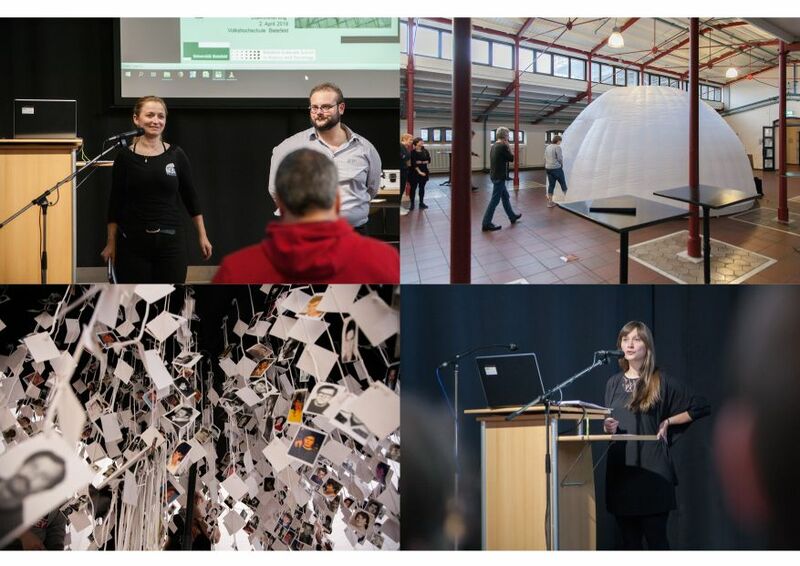 On 5 October the Bielefeld Equality Award got granted for the category Gender Studies. The BGHS is very pleased to inform you that two of the three recipients were members of the BGHS. Alumna Katharina Wojahn got decorated for her dissertation about the topic „An empirical study of female commuters with child” (dt. : „Eine empirische Untersuchung von Pendlerinnen mit Kind“). 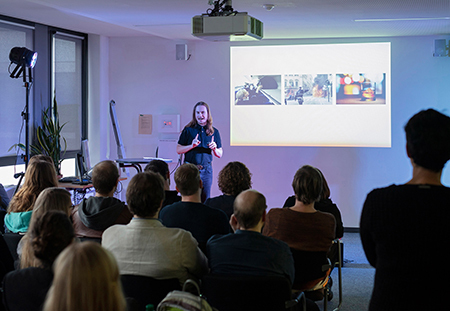 Tabea Schroer, who participated at the Shortcuts Programme 2017 of the BGHS, received honors for her master thesis “Styling Knowledge – Drawing of Boundaries and Affiliations in the Job Biography of Afro Hair Stylists in Germany” (dt. : „Styling Knowledge - Grenzziehungen und Zugehörigkeiten in den Berufsbiographien von Afro Hair Stylistinnen in Deutschland“). 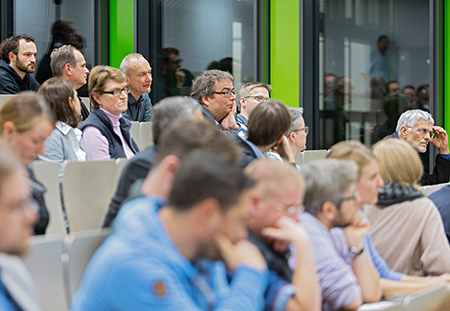 On 18 October 2018 doctoral researchers and employees of the BGHS office visited the headquarters of agricultural machinery company Claas in Harsewinkel. 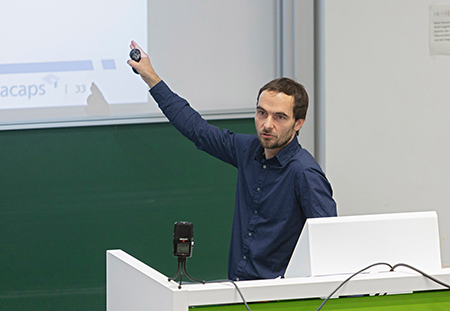 Contact with Claas was made as a result of the BGHS Conference “Non-academic careers” in April, to which Claas's Head of Corporate History, Tomislav Novoselac, was invited as a speaker. 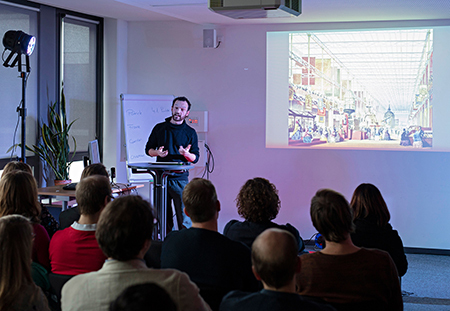 On the one hand, the excursion served to get to know Claas as an employer for historians and social scientists, but on the other hand, it also provided a general insight into the company. The excursion consisted of a company presentation and a factory tour. Subsequently, Tomislav Novoselac gave an insight into his work area, the area of Coporate History. There was a lively discussion about the opportunities and limitations of this field of work. Finally, the participants were able to get to know the work area even better - by visiting the company archive and visiting an exhibition on the history of agricultural machinery under construction. On Wednesday, 10 October the BGHS Welcome Day in winter term 2018/19 took place. Ursula Mense-Petermann, Director of the BGHS, welcomed the new colleagues. 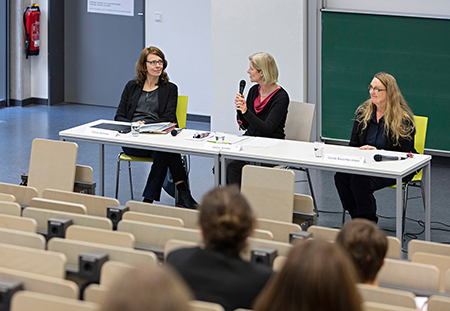 Following this Sabine Schäfer (Executive Management of the BGHS) and Bettina Brandt (Scientific Management of the Department of History) informed the new doctoral researcher about the BGHS, the Faculty of Sociology and the Department of History. After that the doctoral representatives introduced themselves. At the following coffee break in the BGHS-Lounge the doctoral researchers and guests had the chance to get to know each other better. In the second part of the Welcome Day the new doctoral researchers of the BGHS received some more information concerning the doctorate: information on the study programme and BGHS specific formats (Dr. Sabine Schäfer), on financial support and applications for travel- and mobility grants (Dr. Miriam Kanne), on transferable skills and career services (Melanie Eulitz) and on former and planned public science- and Art&Science-projects (Thomas Abel). Information on technical questions and the infrastructure at the BGHS (Frank Leitenberger) completed the session. 15 new colleagues are starting their dissertaion projects this winter term: Five Historians (3 female, 2 male) and nice Sociologists (4 female, 6 male). Eileen Peters (Sociology): How does the organizational framework shape social inequalities between immigrants and natives within workplaces? Aside from the doctoral researcher we also welcome researcher in residence Murat Kalkan at the BGHS. Murat Kalkan is a research assistant and doctoral researcher in labour economics and industrial relations at Istanbul University. His stay is going to last for one year. On Wednesday, 10 October, this semesters Welcome Day will take place. The event begins at 2 pm in the BGHS seminar room (X-B2-103). We welcome 14 new Doctoral Researcher writing their dissertation in Sociology and History as well as the Doctoral Researcher in Residence Murat Kalkan. The BGHS team will introduce themselves and all services. The Doctoral Representatives will introduce themselves as well. Everyone interested is warmly invited! Auf dieser Seite werden nur die der Kategorie Allgemein zugeordneten Blogeinträge gezeigt.